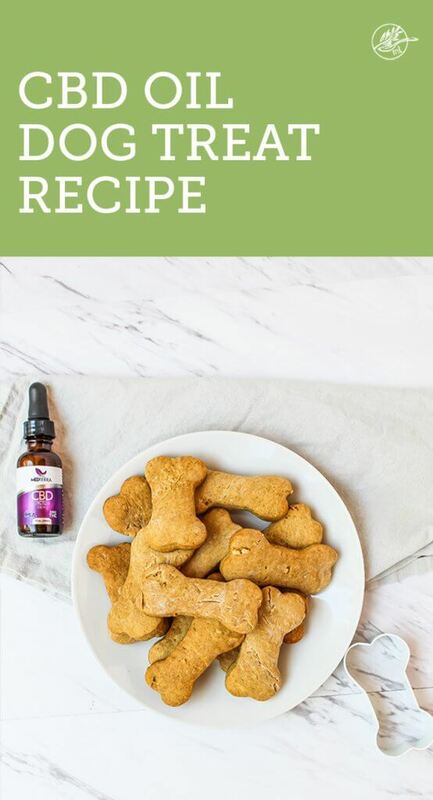 This CBD oil dog treat recipe is ideal for relieving pain and helping to calm your dog. It’s simple to make and uses nutritious ingredients along with CBD oil to save you both time and money. CBD oil is all the rage and the benefits I’ve seen not only in the research but in my own body are mind-blowing! This recipe came about because my son loves his Grandpa’s dog. She’s getting older and having some mobility issues so I wanted to make her some nutritious treats with pet CBD oil, to see if they would help her further enjoy play time with a toddler. Because CBD oil has helped my own anxiety so much, I thought this CBD oil dog treats recipe would be perfect for dogs that get anxious when their owner leaves or suffer noise phobias. CBD may help to improve both depression and anxiety through its interactions with serotonin receptors in the brain of humans. Research shows that CBD can reduce both mental and physical symptoms of anxiety. That said, it’s quite possibly calming and helpful in dogs with noise phobias and separation anxiety. Which CBD oil is best for dogs? Blue Ridge Hemp Co.: This smaller company is mission based and even offers financial assistance to those in need. They formulated CBD oil specifically for pets and more and are very reasonably priced. I chose to use Medterra CBD oil (enter code RNL to save 10%) as it’s what I had on hand. I figured if puppy responded well, we’d move to Blueridge for the next batch. Combine applesauce, peanut butter, eggs, CBD and melted coconut oil in a bowl. Add in baking soda and flour slowly while mixing. Mix until a stiff dough forms. Knead dough or mix just until flour is incorporated. Drop on cookie sheet lined with parchment paper and bake for 15 minutes. If your dog needs gluten free due to GI upset, etc. this recipe will work just fine with an all purpose gluten free flour. I recommend rolling into balls the first time to get a feel for the consistency. 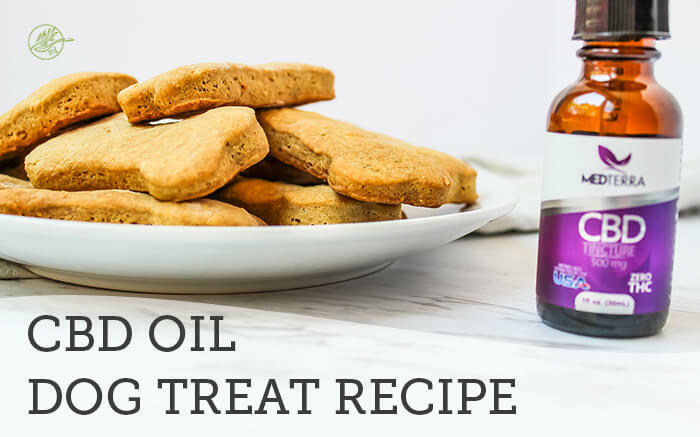 CBD oil amount will vary based on how much you want each treat to contain, so you will have to do some measuring. 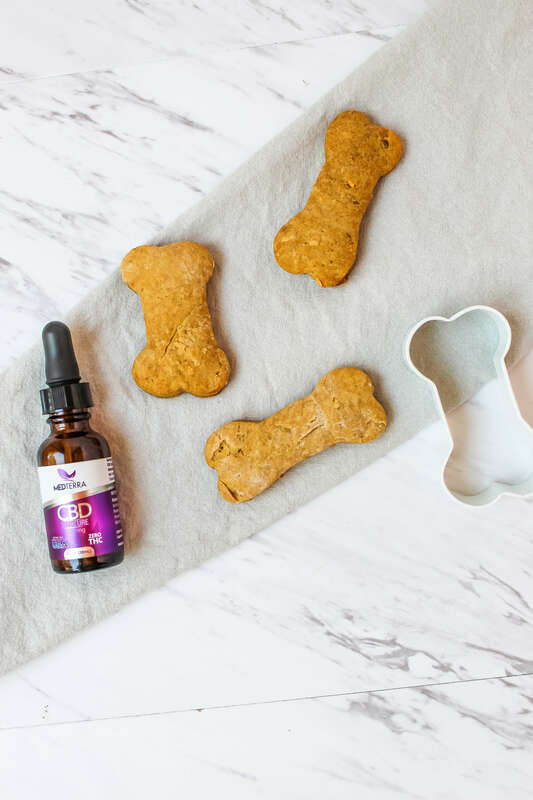 If this is the first time you're giving your dog CBD, aim for about 2 drops per treat, or about 4 droppers full and slowly go up from there. I recommend using Blueridge CBD oil, as it's formulated specifically for pets. I love this parchment paper as it's non-toxic and nothing sticks. I use it for everything! Learn more about CBD oil uses and benefits here. How cool! I bet this is such a helpful little treat for pups. I love that cookie cutter too, I’ve got to find one of those. Definitely a fun one! I guess I better link to it in the post! Ha! What a great recipe and idea! My cat needs some of this right now, lol! I know he can’t have flour, but the CBD part. 😉 Thanks for sharing such a cool recipe and concept. Thanks Megan! I know some pets can’t do flour. 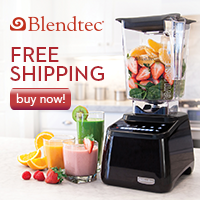 What about almond or coconut flour? Would that work? What an interesting idea! My dogs do get some anxiety and tend to bark a lot at times so I think I may need to try this recipe. It’s a must make for your sweet dogs Jean! What a great idea! And those bone cookies are too cute. Haha! I love them too! Thank goodness for Michaels! If I had a dog, I would absolutely make these!!! Will send a link to my sis-in-law for our family puppy treats. Thank you. Thanks Irena! Me too- hahah! Well gosh isn’t that smart! What a safe, natural way to calm your sweet dogs down and help them through stress! Love this! Wow ! This is so interesting ! 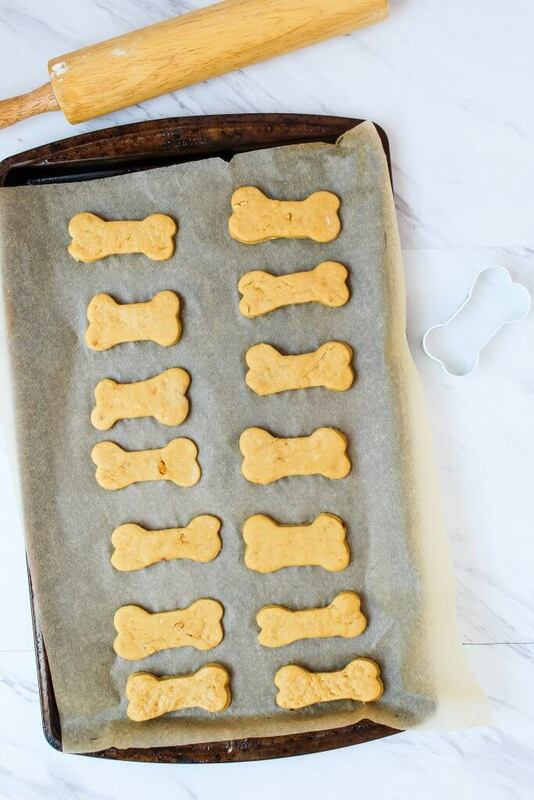 I have two dogs at home and I’d love to make some homemade healthy cookies for them, too ! What a great idea, I don’t have pets myself, but I’ll be passing this on to a few people who could definitely use a calmer pet! Haha, I’ve had some louder neighbor dogs I should share this with too! I do feel bad for the ones with anxiety! My schnauzer would LOVE these! Especially when you go out. He has some separation anxiety. Awe, poor guy! If you try them, let us know how they work. Amazing the flexibility of this oil’s use, thanks for sharing this! Thanks for stopping by and the kind words Darryl! My neighbor has been giving her very old dog CBD oil and it has been helping her feel better. I will share this cute recipe with her and her senior doggy. Thank you Stacey! I hope they help! Hi, I was thinking about doing this, but worried that the CBD would evaporate in the oven. How do you know that the CBD still has bioavailability? Thank You! Great question Denise! You could reduce the heat to 320 and cook a little longer if you’re concerned! Hi Anne! Oh my goodness, I now believe Mom brain is real!I have updated the recipe and greatly appreciate you pointing out my ingredient swap! I love what you said about CBD oil and how it can treat depression and anxiety in animals. Finding CBD pet treats is a great way to keep your animal nice and docile. If I were to buy such treats, I would contact a reliable seller. Thank you! I agree making them yourself or buying from a reputable supplier is so important! Made these today for my dog. He loved them and followed me round until I gave in and gave him another one. Hopefully these will help his arthritic knee. Awe, that is so cute! I hope they help too! We kept them in the freezer and thawed one a day out for my father in law’s dog and it worked well for us! I’d love to make this for my dog as well as my daughter’s dog. Not sure flour is good for dogs (??) Would this recipe work with coconut flour or almond flour? Hi Kristine! Yes, flour is definitely a personal choice with your pet. I have had some good feedback on gluten free flours, but haven’t personally tried coconut or almond flour. I think coconut flour would be a great substitute but you generally want to substitute 1/4 cup to 1/3 cup coconut flour for 1 cup grain-based flour. You may also consider adding another egg. I hope this helps! Yes, exactly. For this recipe 4 droppers would yield about 2 drops per treat. The variable really is the cookie cutter! Yes, I keep hearing so many great stories about the positive effect in animals of all ages. Next Next post: What are Fat Bombs and Why Should I Be Eating Them?